Easy Access Chicago is best used in conjunction with the Chicago Official Visitors Guide and the Chicago Convention and Visitors Bureau website, www.choosechicago.com. Although the information contained in Easy Access Chicago was believed to be correct at the time of publication, neither Open Doors Organization nor any of its officers, directors, employees or members shall be held responsible or liable for any inaccuracies, errors, or omissions nor for information that changes or becomes outdated over time. 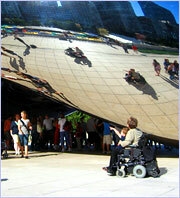 We advise you to call ahead to confirm the information contained in Easy Access Chicago.